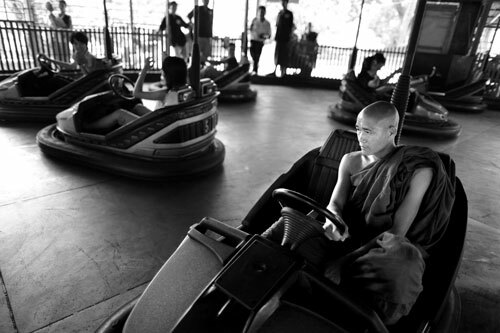 A Burmese monk rides a bumper car at a amusement park in Yangon, Myanmar ( also called Burma) April 18, 2009. Today marked the second day of the New year weekend in the Burmese calendar after 4 days of celebrating the water festival. The UN Secretary General Ban Ki-moon has reaffirmed his concern over the current situation in Burma and once again called on the military junta to release all the political prisoners including Aung San Suu Kyi.